Icons are awesome, right? They can add a lovely little finishing touch to any design. If you’ve got the time to create your own icons, that’s great, well done you!! If you are short on time or just don’t have the skills to knock up your own icons, then a wonderful website called flaticon.com has got your back and will help you make your designs look really professional with some superb graphics. It currently has over 1 million, shiny and cool icons available for you to download. This world icon, for example, has five different design/colour options you can choose from and you can download your chosen icon from the site without having to log in or register or doing anything like that. These icons are great for all sorts of applications, Flat Icon gives you plenty of options for which format to download these files in. Each format lends itself to a different application and can be opened in different ways. SVG/EPS files (vectors): a vector edition program such as Adobe Illustrator is needed in order to open the files and edit them. PSD files can be opened and edited using Adobe Photoshop or any other raster-based software. BASE 64 encoding schemes are commonly used when there is a need to encode binary data that needs to be stored and transferred over media that is designed to deal with textual data. This encoded scheme is helpful for web building development. Okay so we all know you don’t get anything for free, Flat Icon is no exception to that rule, however, they do go down the, if you scratch my back, I’ll scratch yours route. So rather than paying any money to download these icons, what we can do is credit the artist that created the icon in the first place in exchange for being allowed to use it. 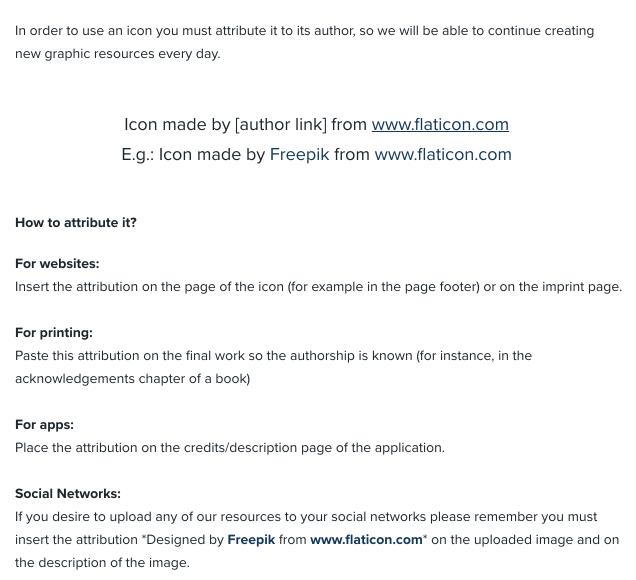 Flat Icon makes it very clear how to attribute an icon to its author and is stated nicely in the site’s help section. Images below show how we’ve done this on our site. You can also check out that page here. You might have noticed that the icons we’ve used have a very consistent look? The reason for this is that Flat Icon authors are able to put together packs. These packs contain a collection of icons that have similar design traits. Packs give you a fantastic option to keep everything looking on brand. Flat Icon actually has two different free account options. A non-registered user allows you to have one icon collection, plus a download limit of 50 icons per day. An icon collection essentially allows you to put together multiple icons that you like and save them on Flat Icon. If you want to go to the next level then you can become a registered user. This is still free and lets you up your collections to 3 and your download limit increases to a massive 400 icons per day. The best thing about being a registered user is that it lets you edit icons, allowing you to change the colours. So if your brand colours are pink and purple, no problem. We’ve put together a little video below where you can see how we use the world icon that we mentioned earlier in this post and changed it to pink and purple. And to let you into a little secret, Flat Icon has a fantastic hidden gem called patterns generator that you can play with here. If you want a nice repeating pattern to sit behind your content then this little thing is for you. We’ve created a pattern from the same Icon set we pulled the World Icon from. So as we said earlier everything we’ve mentioned above is absolutely free of charge!!! But if all the free stuff still isn’t enough. They do offer paid plans too which have a few extra features added in. The sky’s the limit on downloads and collections. The big difference is that you will no longer need to attribute the icons to the artist.